First of all , filling the nitrogen to be heated into the tower, the liquid materials to be dried are transported to the centrifugal atomizer, then they are rotatied in a high speed, and fially, they become the fine droplets, droplets in the drying tower fully heat exchange with nitrogen, the liquid parts have been instant evoperated, the solid parts become powder materials down to the bottom of the drying tower, and the last , the dried powder discharge from the bottom of the tower. 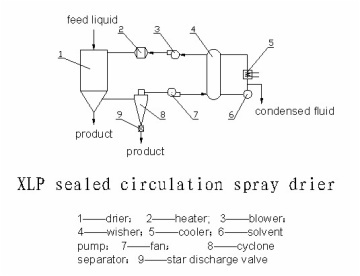 Among them, evoparated organic solvent through the cyclone seperator,bag dedustor to remover the powder in the role of the blower, and then by the condenser , the dust removered saturated organic solvent gas into liquid discharge from the condenser, in case the liquid be carried out,there has addied a gas-liquid separator. Among them, as a drying medium for the inert gas being heated as a dry carrier in the system used to re-cycle. 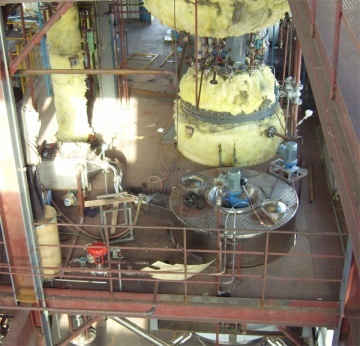 Explosion-proof closed cycle centrifugal spray drying system is working in a confined environment, drying medium is inert gas (like nitrogen), positive pressure operation in the drying tower, If the internal pressure decreased, the pressure transmitter can control the nitrogen amout entered into the drying tower automatically, to ensure system pressure balance. Because adopt the nitrogen as the cycle medium, has a protection affact to the materials to be dried, the medium like nitrogen has a affact of bearying moisture, demoval moisture and cycle -transmission, the media can be used cycled. 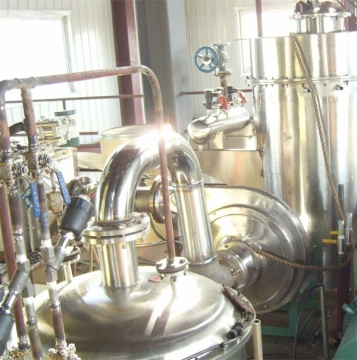 However, the normal centrifugal spray drying processing to achieve the removal moisture goal by suction air ,exhaust air continuously, negative pressure operation in the drying tower , this is also a clear distinction between explosion-proof type centrifugal spray drying system and the ordinary centrifugal spray drying system. 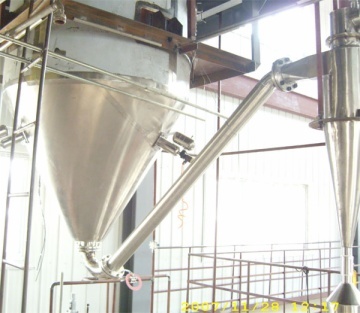 So, explosion-proof type centrifugal spray drying system is specialied suitable for drying the organic solvent materials, toxic materials and the materials are easy to oxidized in the drying processing. Closed cycled centrifugal spray drier is suitable for the organic solvent contained in the solvent , Latex suspension and paste liquid,Volatile toxic, oxidizable gas, which need to be solvent reconvery, it both has all the advantages of the centrifugal spray drier,and there is any powder discharged into the open air durying the drying processing,mostly can reconvery the finished products 100﹪. The solvent reconveried by the reconvery system,can be treated second time and cycle use, so that Greatly reduces the cost of production, and avored by the majority of users. Widely applicated in the pharmaceutical , chemical industry , foodstuff , ect. This system equip with the condenser system for dried material solvent and the reconvery system ,ensure the solvent contained in the dried material be treated second time and recycling, so that deGreatly reduces the cost of production. Adopt full closed design, so that the collecting rate of the finished products is very high ,and other drier can not reach this requirements. Equip with rinsing tower device in the system, and adopt advanced atomizing rinsing device in order to improve the operational reliability. For the oxidizability material , the Cycled closed centrifugal spray drier use inert gas as the media, ensure the materials are not oxidized.